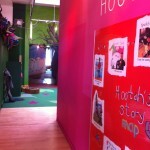 Kids will love the Discover Children’s Story Centre. Just a stone’s throw from Stratford station and the Westfield Stratford City shopping centre, Discover allows children to play, interact and create stories. My friend and I went along on a weekday morning with two toddlers and a baby in arms. There was a “Tots and Tales” storytelling session about to take place in the outdoor Story Garden, so we decided to check it out. 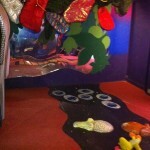 The session was aimed at tots from 6 months plus, and was a fun jungle story with music and movement. It seemed to keep our little party entertained for half an hour or so before we let them loose to explore the rest of the Story Garden. The Story Garden has a wealth of equipment for imaginative play: a large wooden pirate ship, a wooden taxi cab, a giant spaceship and a wall full of pots and pans you can hit with a drumstick (our particular favourite) to name a few. There’s also a pagoda where the Tots and Tales session took place, and a picnic area. Heading inside, there’s an interactive Story Trail with all kinds of story-related activities such as a dressing up box, a magic tower with a slide, a trip trap bridge, a secret cave and a room where my son spent ages jumping on multi-coloured lights on the floor which make music. There were lots of staff members on hand to help fire the children’s imaginations and to help out at the arts and crafts table (where we made some Olympic torches and medals). 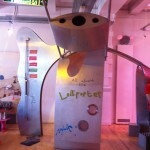 The Discover Children’s Story Centre bills itself as “London’s only children’s museum”. I haven’t verified the accuracy of that description, but it’s true that Discover is entirely dedicated to teaching and entertaining children. 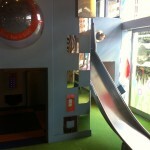 There’s plenty to keep even very small toddlers busy for a couple of hours. Admission costs £4 (£4.50 with gift aid) for adults and children, £16 for a family of four. Admission is free for the under 2s. There is a café at the entrance to Discover selling hot and cold drinks, and snacks. There is outdoor seating in the garden. 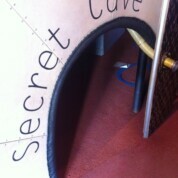 Discover is pushchair accessible and has baby changing facilities. There are regular sessions, workshops and events – check website for details. Discover is open Tuesday to Friday from 10am to 5pm, Saturday and Sunday from 11am to 5pm. By train: The nearest tube station is Stratford (Central and Jubilee Lines, DLR, Overground and national rail services). There is also a new DLR station on Stratford High Street. By bus: 25, 86, 108, 425, D8, 257, 308, 104, 238, 241, 262, 158, 473, 276, UL1 and 69.